Got an old black coat you're no longer wearing? A bit of trim, perhaps? High boots? (Well, we know you've got those.) Congratulations, Lady Cap'n, yer a pirate! As a bonus, you even get to wear something comfortable underneath that imposing garb. And most importantly -- don't forget a parrot! 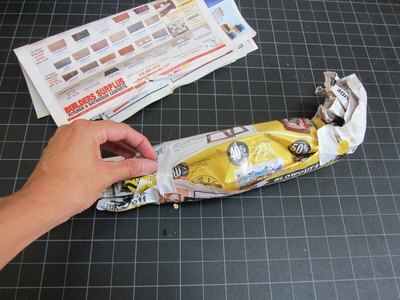 Crumple up paper and roll another sheet of newspaper around the crumpled paper. The roll should measure around 8 inches long and 3 1/2 inches wide. Tape the roll in place. Hook the top slightly, and this will be the head of the parrot. 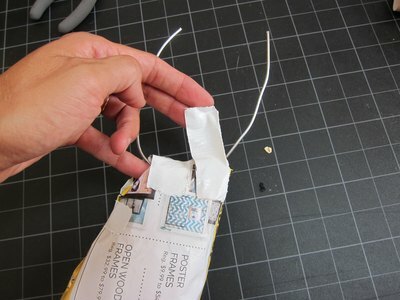 Clip a 9-inch piece of armature and tape it at the middle to the bottom of the roll. 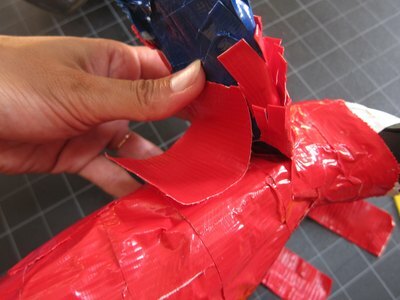 Wrap the bottom inch of the armature with thin strips of newspaper, then red duct tape, tapering the tape "legs" from wide to narrow where the tape meets the wire. Leave 3 to 4 inches of wire. Wrap the whole tube with strips of duct tape up to the crook of the neck. Make sure it is solid but still light, add in more newspaper stuffing inside as you go, as necessary. 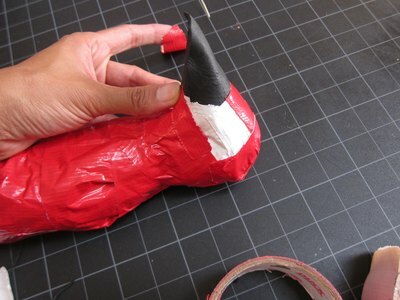 At the top of the neck, add a ball of newspaper to the head and a black cone of a stiff material to make a beak. Place strips of white duct tape next to either side of the cone where the eyes will be. Out of your craft foam sheet, cut two 8-inch wings that are mirror images of each other. Peel the sticky back off of the back and crumple a 1/2-inch layer of newspaper over the wing, sticking it to the sticky side of the wing. 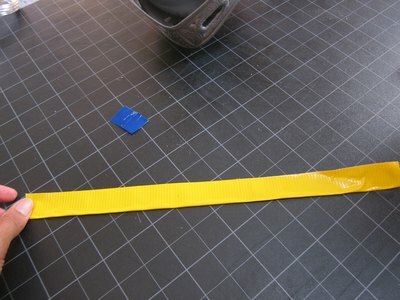 Fold strips of duct tape under, leaving 1/4 inch of the sticky strip at the top edge. Cut into the bottom edge every 1/8 inch to 1/4 inch. Tape in layers starting at the bottom of your wing all the way to the top. Tape the top front of the wing and underneath the wing where the wing meets the bird. 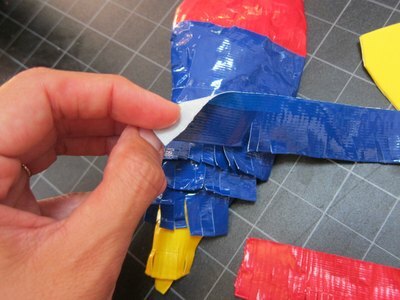 Fold 16 pieces of tape in exactly half length-wise that measure 8 to 12 inches long. Cut one end into "V" shapes. Tape these to the back of the bird in layers. These will become the tail of the bird. 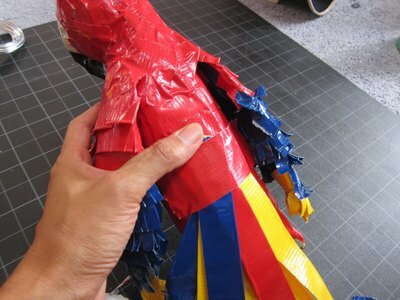 Finish the face of the bird by covering the stiff fabric of the beak with black duct tape and curving the tip of the beak. Draw two little round eyes with a permanent pen. 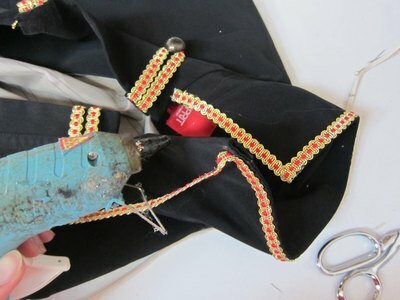 Remove the existing buttons of your disused long coat with scissors, making sure not to cut into the coat itself. Measure 2 1/2 inches in from the edge of the front opening of the coat, in line with where the button holes are on the left and the old buttons used to be on the right. 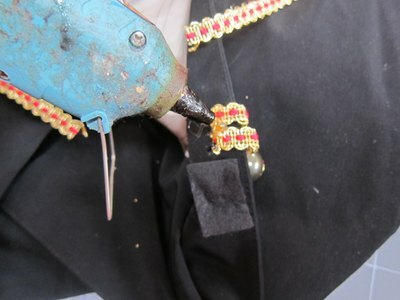 Make a mark and sew your new, pirate-themed buttons on. Cut 9 inch lengths of 1/2 inch ribbon for each new button you've added to your coat. 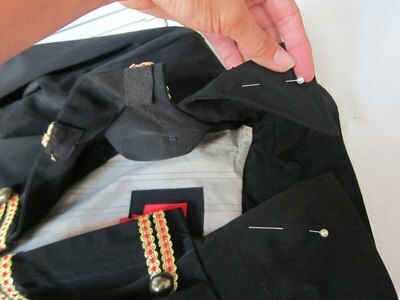 Loop the ribbon around each button at the half way point, folding the ribbons around the opening of the coat. 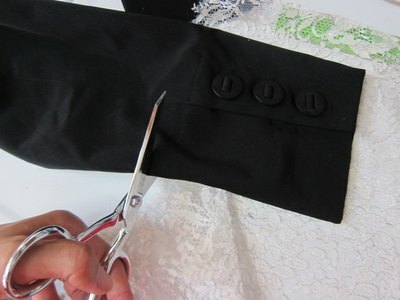 Cut black felt squares that measure 1 inch by1 1/2 inches, and hot glue the ribbons to the back side of the placket, covering the ends with the black felt squares. 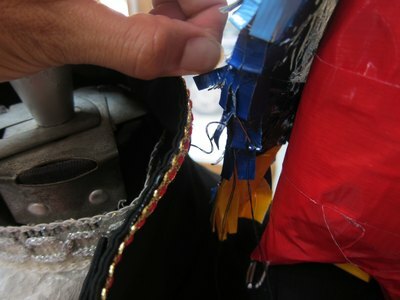 Add trim to the pockets and the bottom edge of the coat turning ends of ribbon under. 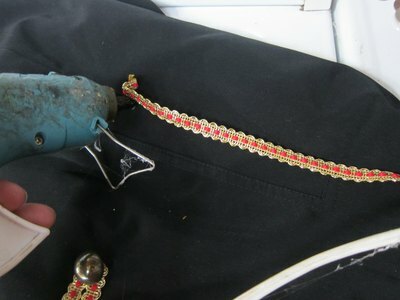 Make the collar into a Mandarin style, stand up, captain's collar by turning the corners inward, pinning them, then hot glueing them in place. Add trim to the collar starting at the base of the back and glueing the trim to the top corner, around the back, then down the other side. Cut both sleeves off right below the elbow. 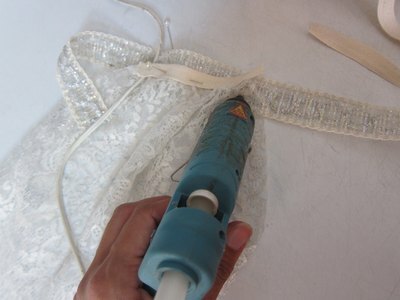 Hot glue a lace ruffle to the top 1/4 inch of the inside edge of the cut sleeve. Hot glue a cut piece of ribbon to the cut edge of the sleeve to cover the edge. 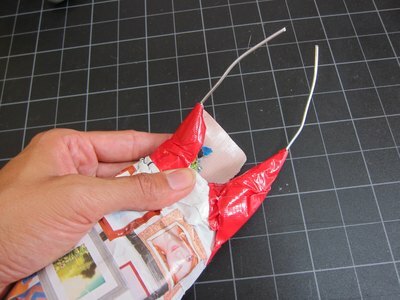 Bend the ends of the wire feet with pliers into paperclip like shapes. Perch the parrot on a shoulder, then hand-sew both feet to that shoulder. 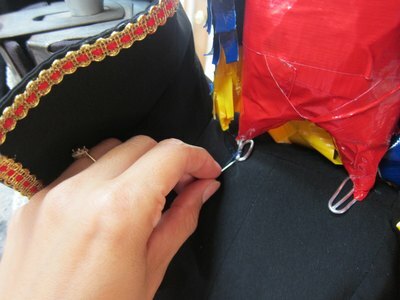 Sew the closest wing the the collar of the jacket to stabilize the parrot. After putting the costume on add two straight pins from the inside of your hat into the parrots body to make him even more stable. 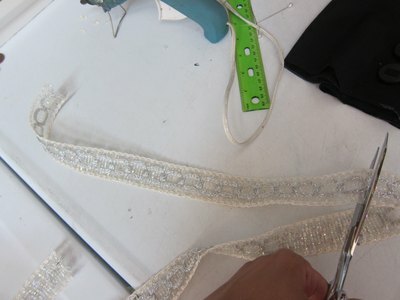 Cut a length of 1 inch decorative ribbon to a length where it can fit around your neck and overlap by 1 inch. Find the middle of the ribbon, ruffle the top of an 8 inch piece of lace and straight pin it to the back of the ribbon, centering it. Press another ribbon behind it to prevent from burning your fingers. This will also make it more comfortable to wear. Safety pin the collar behind your neck to close it and you are ready to walk the plank. Make sure you add your extras like a pirate hat, a hook, a gold earring, an eye patch, and a sword!